Home » Colgate, James B.
JAMES B. COLGATE, banker, born in New York city, March 4, 1818, is a son of William Colgate, who came to America in 1798, settled in Harford county, Maryland, and, in 1804, removed to New York, where he established the now widely known industry of manufacturing Colgate’s soaps. James B. Colgate has been for many years a banker and dealer in securities and bullion. Although he makes his home in the adjoining suburb of Yonkers, he has contributed generously to the support of the great museums and art institutions of New York and to the promotion of the work of the Baptist church. One of his latest gifts was a $60,000 house of worship for The First Baptist Church of White Plains. Large donations have been made to The Warburton Avenue Baptist Church in Yonkers, Madison University, Rochester University, Rochester Theological Seminary, Colby Academy, Peddie Institute and Columbian University. He is a member of the Down Town and New England Society. 1890, Washington and Alaska. 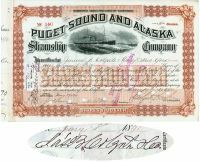 Stock certificate of the Puget Sound and Alaska Steamship Company. Brown/Black. Lovely engraved vignette of a steamship in rough seas at top center. Printed by Franklin Bank Note Company. Issued to and signed on verso by James B. Colgate. JAMES B. COLGATE, banker, born in New York city, March 4, 1818,was the son of William Colgate, who came to America in 1798, settled in Harford county, Maryland, and, in 1804, moved to New York, where he established the now widely known industry of manufacturing Colgate’s soaps.